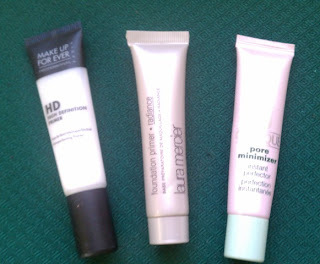 Face Primers – I have three in my bag right now, though only two of them are actual primers and they’re both deluxe samples, not full size - Makeup Forever HD Primer (my holy grail!) and Laura Mercier Foundation Primer-Radiance (which is nice if you want a bit of glow). I also have a tube of Clinique Pore Minimizer, but I only tend to use it in warmer weather because it has a slightly mattifying effect. 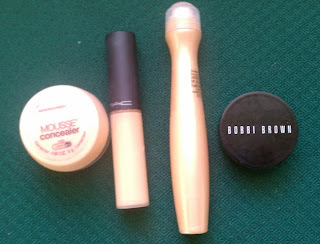 Concealers – I have four concealers in my bag at the moment, but two of them are in there mainly because I want to use them up - the Maybelline Dream Mousse Concealer in Fair and MAC Select Moisture Cover in NC15. I like the Moisture Cover for under the eyes because it has a slightly peachy undertone, but I’m not crazy about the Dream Mousse Concealer. I also have the Garnier Nutritioniste Skin Renew Anit-Dark Circle Roller and Bobbi Brown Corrector in Porcelain Peach, both of which I love as I’ve mentioned. 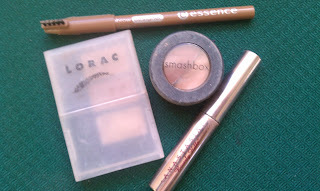 Under Eye Powder- I have Benefit’s Powderflage in my everyday makeup bag. It’s a pricey product, but it sets under eye concealer pretty well. And I use so little each day that I’m still on the first container I bought a year and a half ago. 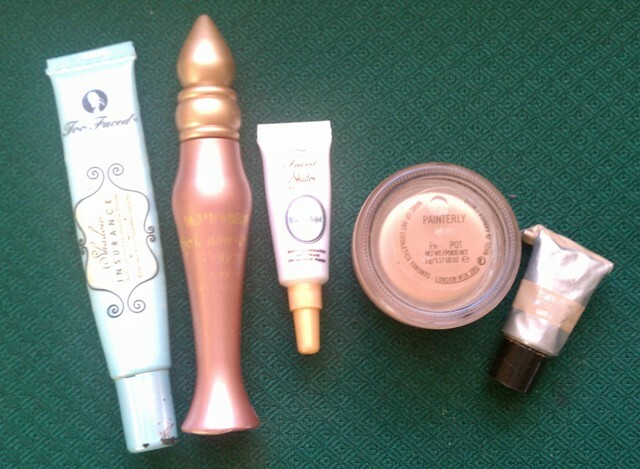 Eye Primers and Bases- I keep a tube of Too Faced Shadow Insurance (TFSI) as well as a bottle of Urban Decay Primer Potion in Sin in my go-to makeup bag. I also have a small sample of TFSI in Candlelight. More often than not, I wear the regular TFSI. I also keep my MAC Paint Pot in Painterly and a L’Oreal HIP Creamshadow Paint (I think these have been discontinued) in Secretive. I use these over the TFSI when I want to hide any discoloration on my eyelids. They’re both pretty much skintone in color, but the Hip Cream Shadow Paint has a satiny finish as opposed to Painterly’s matte finish. Mascara – I have a ton of mascaras because I’m always getting kits that come with one, but I generally only have two open at a time. Right now, it’s Maybelline’s The Falsies Volume Express Waterproof in Very Black and Benefit’s Bad Gal Blue (I find blue mascara to be very brightening and this is a good one). I also have a beat-up e.l.f. 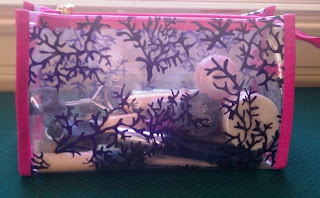 lash curler in the bag that I really need to replace. Brow Products – I dye my hair a light auburn color, but since red fades so quickly, my hair can vary in color depending on how long ago it was dyed. As a result, I keep brow products in a couple of different shades in my daily makeup bag so I always have something that matches. Right now, I have a pot of Smashbox Brow Tech in Smashing Auburn, LORAC Take a Brow Kit in Blonde, and an Essence Eyebrow Designer Pencil in Light Brown (which is really more of a dark blonde if you ask me). I always keep a tube of clear brow gel or mascara in my bag as well. Currently, I have a sample of Anastasia’s Clear Brow Gel. Highlighting/Contouring Products – I have such fair skin that it’s usually tough to find a contouring powder, be it a blush or bronzer, that’s light enough to work on me. Bare Escentuals’ Natural Light has been kind of a God Send – the Back-Lit color is just dark enough to look natural on me. And to think I let this sit in the back of a drawer for a couple of years! When I want a subtle highlight, I use the Well-Lit shade from the duo. 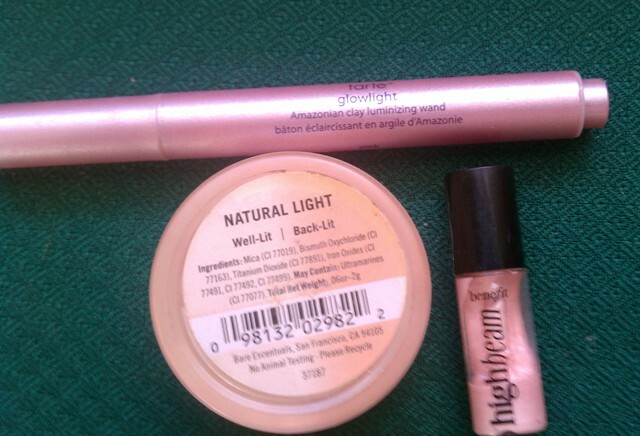 I also have a sample of Benefit’s Highbeam and Tarte’s Glowlight Amazonian Clay Lumizing Wand in Pink. Lip Balm – I always have a tube of some type of lip balm in my bag to prep my lips for lipstick or gloss. 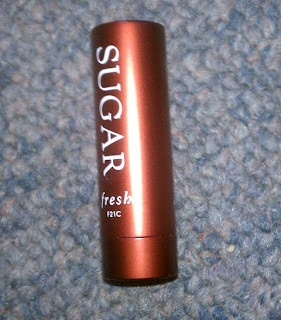 Right now, I have a small tube of the Fresh Sugar Lip Treatment, which was part of the Sephora birthday gift that I just received. It feels great on the lips and has an SPF of 15, which is always good. Do you keep all of your everyday products in a separate bag or drawer? What are your daily essentials? Do you have any makeup organization tips that help save time in the morning? what size bag is that? It's about 10x5. A medium size bag, I'd say. Hope that helps!